Ready-Set-Read: Could you show some love for my blog? Could you show some love for my blog? Happy Valentines Day to my reader friends! I hope you have a wonderful day -- whether you have a Valentine to spend the day with or whether you are spending it with sugared up kids or whether you feel "alone" this Valentine's Day-- I hope something today brings you a feeling of being loved. I spent many a Valentine's Day alone while I was waiting to meet the perfect man that God had for me. I remember waking up on those days saying, "God, could you just show me something beautiful today? Something that is a sweet Valentine's Day present from you to me." As I wake up on this Valentine's Day, that memory makes me smile. We are having warmer and beautiful days all week and I think that God is double blessing me- with a sweet Valentine and something beautiful! I also think of those that are spending Valentine's Day feeling a little unloved and I just wonder if God isn't trying to show them something beautiful. Of course, this year, as I said I am double blessed. I might even be triple blessed because I'm spending Valentines day with my husband and kids. Granted, my husband is at work- but we had an awesome day of shopping on Saturday. He doesn't like to shop- but he put up with it all day just for me! And we bought a new camera. Unfortunately it was out of stock and so it should arrive on Wednesday. I hope to take my blog to a whole new level!!! In the meantime, however, my blog HAS gotten a little bit of love. 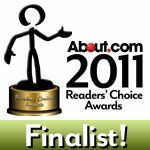 Someone nominated my blog for the Best Live and Learn Parenting Blog Readers’ Choice award on About.com and it has been selected as one of five finalists to head into the final voting process. I don't even know who nominated me but Thank you to that person for showing my blog some love. Happy Valentine's Day! I'm off to fry up some donuts for my boys and start them off on their sugar-high! Congratulations! You get my vote! How nice! I am off to vote. Happy Valentine's Day! I will definitely go vote for you! I voted too! Literacy rules! just voted!1 good luck to you, my friend! !